This unique wall clock is perfect for a doctor’s office or home. The reclaimed wood base is hand painted matte white. The gold glitter glasses are die cut by hand, and placed on the face. This is a Shannybeebo original and can be customized using your favorite colors. Clock size shown 12" x 3/8”. Choose your clock size from the dropdown menu. Assembled with a new quartz clock movement. - Clock hands will vary, please let me know if you have a particular style or color in mind. - No Minimum Purchase Required. - Free First Class Domestic Shipping. My order arrived in a very timely manner and was in beautiful condition. It was a birthday present for my daughter and she was thrilled. Great communication with seller and love the clock. Its so quite I could use it in my bedroom. Ill def be ordering more clocks for my house! It is important to contact me prior to ordering a clock with a silent mechanism to make sure it will fit your clock. I do accept wholesale orders. Please contact me to discuss options. Do you create custom clocks not listed in your shop? Yes! 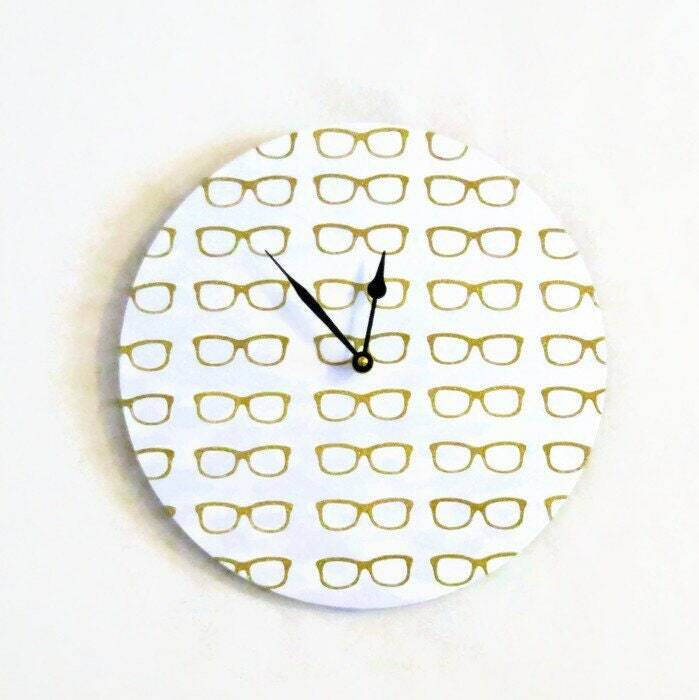 I love working with each customer to create clocks listed in my shop, or custom items. I will match colors, etc. to the best of my ability. I check each clock mechanism prior to shipping. If you find that your mechanism is not working correctly, please let me know as soon as possible. This is not a common occurrence, but If the package was handled roughly during shipping, the small parts of the mechanism may have been thrown out of whack. I will replace the mechanisms and hands immediately. In some instances, I can quickly walk you through resolving the issue. If you mechanism stops working several months or a few years after you purchase, send a message my way. I stand behind my products and will help resolve the issue. Purchasing or receiving a Shannnybeebo Clock design does not transfer rights for reproduction. I reserve all rights to my original designs, photos, brand name and written content. They may not be reproduced and are copyright protected. Copyright infringement is taken seriously and may result in legal action.